On our wedding day. Taiko is sporting traditional headgear to hide her horns. Really, that's what they say it's for. Why wait until after the wedding to begin drinking? We met while Johnnie was living and working in Yokohama, Japan and were married 364 days later in Taiko’s home prefecture of Ibaraki. 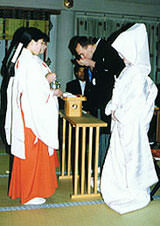 During the Shinto ceremony, we drank saké, as is the custom, and Johnnie’s friends teased him, saying it was a purely symbolic gesture and that it would be bad form for him to request a refill from the priest. Taiko was nervous, and instead of taking the customary three tiny sips, she did an ikinomi (literally, “one breath”) slammer. Johnnie’s love and admiration for Taiko suddenly knew no bounds. 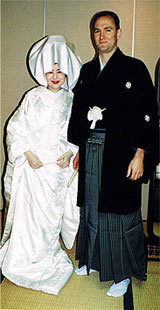 We relocated to Seattle in August of 1996, and accomplished our goal of finding Japan-related work. After a number of job changes, we eventually established a wholesale apparel company to export new and used clothing to Japan. After a few years, we began discussing the possibility of using our company to import Japanese goods for sale in the U.S. It was important to us to find something rare and uniquely Japanese that we could share with U.S. consumers, and somehow we hit upon the idea of premium saké. During our trips to favorite Seattle Japanese restaurants and Asian grocery stores, we often lamented the lack of quality saké choices, knowing there must be thousands of unique and delicious brews being produced throughout Japan, but not yet known in the U.S.
Our personal experience confirmed this intuition; Johnnie’s adopted “second hometown” in northern Japan (Iwate prefecture), where he lived for three years, boasted five breweries (with a population of only 30,000! ), and Taiko’s home prefecture, Ibaraki, features over sixty. In fact, there are over 1400 saké breweries in Japan today, each producing numerous brands. The more we discussed the situation, the more we realized that we had found something we were passionate about bringing to U.S. consumers: high-quality, locally produced, premium Japanese saké.